While not announced as part of this week’s GTC keynote, during the keynote itself word got out via Reuters that the company had suspended their active testing of their DRIVE autonomous vehicle driving system. Later confirmed and expounded upon by NVIDIA, the company was pausing public road testing of self-driving vehicles in light of last week’s fatal self-driivng Uber collision in Arizona. Noting that they wanted to be able to learn from the incident, they opted to stop and see what the investigation turned up. And while the pause makes sense for both political and practical reasons, since then there’s bit a bit of confusion over just what NVIDIA’s involvement was with the Uber vehicle in last week’s incident and the timeline of their response. So as part of a GTC press Q&A session yesterday afternoon, NVIDIA CEO Jen-Hsun Huang clarified a few details about the incident – at least to as much as NVIDIA is able and willing to do. On the hardware side of matters, NVIDIA is confirming that the Uber vehicle was using NVIDIA GPUs, but that it wasn’t using the company’s DRIVE platform. This matches earlier reports that NVIDIA hardware was in the vehicle. Uber for its part has been using NVIDIA GPUs in this fashion since 2016 – including in Arizona – well before the announcement of the closer partnership with NVIDIA back at CES 2018. As a result the vehicles in Uber’s existing fleet are using NVIDIA’s GPUs in a commercial off-the-shelf capacity paired with other processors, all running Uber’s own software stack. This is as opposed to NVIDIA’s DRIVE platform, which utilizes NVIDIA processors throughout (SoCs and GPUs), with NVIDIA’s DRIVE software package running on top of that. As one of the early leaders in the field, it’s of course in NVIDIA’s best interests to make sure that they avoid negative controversy, especially in the case of collisions. So the distinction between GPUs and DRIVE is for them quite significant; the accident doesn’t reflect any of their technology on sensor fusion, hardware fault tolerance, or the all-important neural networking-based software stack that actually acts on all of this data. Consequently however, it also means they’re largely out of the loop of the investigation; since it wasn’t NVIDIA’s platform, the investigation is being undertaken by Uber itself, which is part of the reason why NVIDIA’s comments have been so reserved. Meanwhile as for the testing pause itself, Huang mentioned that the halt actually happened a couple of days earlier than Reuters first reported, with NVIDIA stopping “a day or two later” after the initial news came out. 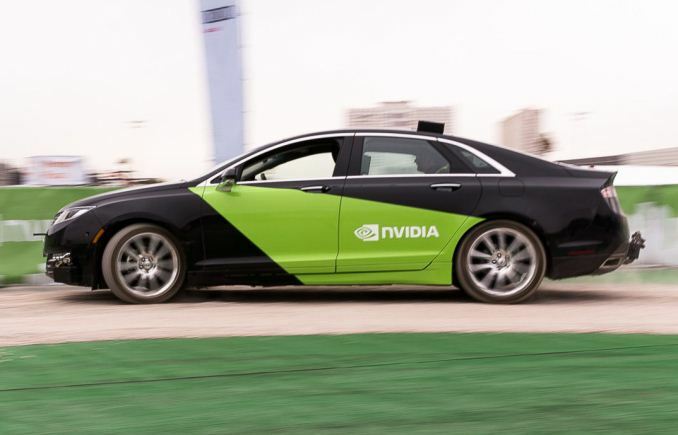 In the meantime NVIDIA is continuing to manually drive their test vehicles on public roads in order to continue collecting data and training its neural networks. The event, while clearly not fortuitous for anyone, does none the less come at an interesting time for NVIDIA. The company has previously been developing their simulator systems for training neural networks – including self-driving cars – which they are now moving forward on as a commercial product with the DRIVE Sim and Constellation systems, which are set to launch later this year. It’s not clear if NVIDIA is already able to use the prototypes for practical training internally – and regardless real-world testing will resume sooner than later – but the Uber incident means that simulated training just became a much more valuable field, much to NVIDIA’s benefit. All true it was almost assuredly the fault of the pedestrian crossing the road without checking for traffic in a dark area. And I doubt any human driver could have prevented the accident or outcome. But considering that the sensors should have better than human vision and the system should have better than human reflexes, it is still important to find out why it didn't notice the pedestrian and didn't react even when she was visible in the headlights. The issue is did Uber live up to the expectations of what an autonomous vehicle should be able to do. First at least matching what a human driver would have done, second exceeding that because of the additional capabilities. While it appears (at this point) that a human driver would have possibly killed or injured the pedestrian, there would have been some braking done by most people. If the Uber car had been operating at our expectations of an autonomous vehicle it's lidar or radar systems should have "seen" the pedestrian more than five seconds out and should have slowed down. Again it appears that did not happen. Looking at the video my sneaky suspicion is that the car DID in fact hand control back to the safety driver who may have been distracted but it's a pure speculation of my part. The fact that they stopped testing is very suspicious though.